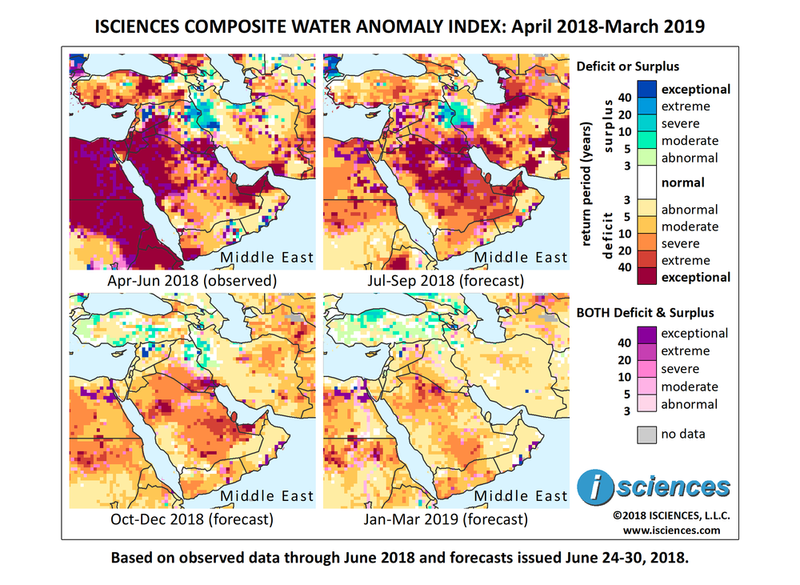 The forecast for the 12-month period ending March 2019 (below) indicates a range of intense deficits for many parts of the Arabian Peninsula and parts of the Levant, and relatively moderate conditions elsewhere in the region. Extreme to exceptional deficits are expected to dominate northern Saudi Arabia, Jordan, and United Arab Emirates. Primarily severe deficits are forecast for West Bank, Lebanon, Iraq west of the Euphrates River, Kuwait, southern Saudi Arabia, Qatar, and most of Yemen, though conditions will be exceptional in southwest Yemen. Moderate to severe deficits are forecast for central and southeastern Turkey, and some exceptional deficits are expected along the western coast. Intense deficits are forecast for Turkey’s northern neighbor, Georgia, and mixed conditions are forecast for Syria. Some surpluses are expected in a broad band encompassing the Iraq/Iran border, and moderate deficits are forecast for many other parts of Iran, though deficits in southern Khuzestan Province will be extreme. The forecast for the next several months through September indicates that deficits in the Levant will downgrade but remain intense in West Bank and Lebanon. Exceptional deficits are forecast for much of northern Saudi Arabia and deficits in the south will intensify. Deficit conditions are expected to be extreme in Qatar, United Arab Emirates, and across the border into Oman. Moderate to severe deficits are forecast for southern Oman and for Yemen. In Turkey and Cyprus deficits will downgrade and shrink somewhat but much of Turkey will continue in moderate to severe deficit with more intense pockets in the center of the country. Deficits will moderate in Georgia. Exceptional deficits are forecast to persist in southern Iraq and severe deficits west of the Euphrates River. In Iran deficits will increase and become more intense, with large blocks of exceptional deficits in the south along the Persian Gulf and near the Strait of Hormuz, from eastern Kerman Province to Afghanistan, and in the north along the western border of Turkmenistan. Surpluses will persist along the northern Iraq/Iran border. From October through December exceptional deficits in Saudi Arabia will nearly disappear though severe to extreme deficits will persist. Deficits in southern Iraq will diminish only slightly but remain extreme to exceptional, and severe deficits will persist in the west. Extreme to exceptional deficits will also persist in Qatar and western UAE, moderate to severe deficits will persist in Yemen, and deficits in Oman will downgrade to mild. Deficits will downgrade in the Levant as well, becoming mild overall, and in Iran, becoming mild to moderate with some more intense pockets in the east. Turkey is expected to transition away from deficits to scattered, moderate surpluses, including along the Sakarya River and along the Firat River south of Keban Dam Lake. The forecast for the final quarter – January through March – indicates that deficits will diminish in much of the region, but persist in Saudi Arabia and Yemen. Pockets of moderate surpluses will increase in Turkey. As drought and water shortages plague Iran, protests continue to flare in the southwest. Demonstrators clashed with security forces during several encounters in late June, resulting in 11 injuries and 200 arrests. Water pollution added to the grievances after 230 people were poisoned by contamination. Water rationing was instituted in Abadan when water from the Bahmanshir River reached salinity levels comparable to sea water. Shrinking water levels in dams have reduced hydroelectric production, resulting in frequent power outages in Tehran where economic woes have sparked protests. An Iranian general has accused Israel of causing Iran's drought by stealing water from clouds over the Mediterranean. Precipitation in Iran over the last nine months through June of this year was 26 percent below the long-term average. Protests have also erupted in Iraq over basic services, water, and jobs. Demonstrations in Basrah left 8 people dead and 56 injured in mid-July. The prime minister has ordered tanker trucks to the area to deliver drinking water. Compounding the issue of lower precipitation, Iraq's water supply is further jeopardized by Turkey's largest hydroelectric project, the Ilisu dam. Iraq’s wheat crop acreage could decrease by as much as 50 percent next season due to Turkish water diversions from the headwaters of the Tigris River to fill the dam. The Iraqi government had announced a ban on water-intensive crops such as rice and and corn for the current season, though ultimately the ban was partially reversed and nearly 5,000 square miles of rice was allowed. Insurance loss claims associated with Cyclone Mekunu, which ravaged Oman in late May, amounted to 75 million riyals (USD $195 million) by late June. Property, vehicle and marine equipment losses comprised most of the claims. Flash floods hit parts of northeastern Turkey late last month, submerging several vehicles and the construction site of a planned hydroelectric plant. Heavy rains burst the banks of the Delichay River in Azerbaijan last month, flooding dozens of houses and sweeping away livestock in the northwestern Balakan district. Fields of tobacco, wheat, barley, and corn were flooded, and part of a highway was destroyed.